Skip bin hires have grown common in Newcastle and several parts of Australia, and that’s understandable. They are convenient, easy to use, and dependable whether for home or for business. If you are still not sure whether you need a domestic skip bin or a commercial skip bin, here’s a quick write-up to help you. The real difference between domestic and commercial skip bins is the sizes. Obviously, the sizing determines how much waste it can hold. Because it is illegal to overfill a skip, it is important that you get a size that suits not only your project but also the amount of waste you plan to have it carry. Overfilling must be avoided. In order to determine the kind of skip bin you need, you have to overestimate as well to avoid paying for a second skip bin. Skip bins are usually described by how much space they have per cubic metre. The number of cubic metres a skip can hold determines if it is a domestic skip bin or a commercial skip bin. Domestic skip bins usually hold 2 to 8 cubic metres. Mini-skips hold 2 to 4 cubic metres, while midi-skips measure 6 to 8 cubic metres. Domestic skips are ideal when you are undertaking home renovations, garden landscaping, wood-working projects, moving house, or DIY projects, among others. Domestic skip bins are good for short term activities or small-time renovations and rearrangements. Basically, domestic skip bins are best used for activities involving personal use or a residential dwelling. The volume of rubbish expected is generally smaller than large-scale commercial waste, so the skip bins are significantly smaller than commercial skip bins. Commercial skip bins – what about them? Commercial skip bins, on the other hand, hold 8 to 30 cubic metres. Maxi skips can measure around 8 to 16 cubic metres, while the bigger commercial skips (also known as roll-on, roll-off skips) measure 20 to 30 cubic metres. Of course, unlike domestic skip bins that are usually for short term uses and for small time projects, commercial skip bins are for bigger construction or demolition projects, moving office premises, waste removal for big businesses, and extensive commercial or office renovations. Projects that usually result in a lot of waste products can perfectly utilise commercial skip bins. These are not just limited to big, long-term projects. Industries that continually generate a significant amount of commercial waste like hospitals, hotels, manufacturing industries and the like are also perfect examples of business where commercial skip bins are necessary. 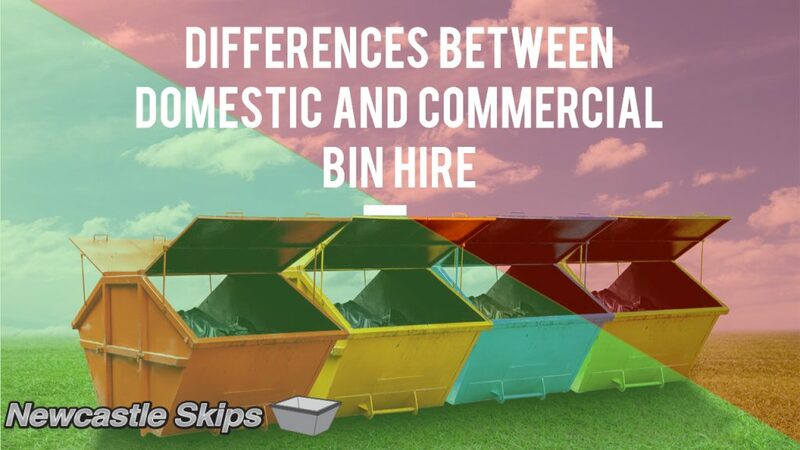 For both these kinds of skips, skip bin hire appear to be the better and more beneficial choice than purchasing your own skip bin. Skip bin hire helps you carry and take out the trash without added effort on your part, depending on the agreement you enter into. Moreover, with a skip bin hire, you can be assured that you can do your home renovations or operate your business without delay caused by organising your own waste collection and segregation. You can do away with dealing with the waste and let a professional handle it. In need of skip bin hire in Newcastle? Why not choose a dependable, locally owned business that has been around since 1999? Go for Newcastle Skips! Here at Newcastle Skips, we offer a variety of services for you to choose from. Our services include skip bin delivery and hire, rubbish removal, and other general waste bins. We also have a wide array of skip bin sizes ranging from domestic sizes to commercial skip bin hires. Contact us on 0405 490 000 for more information and a free quote.